Occasionally I like to post questions here that I get asked through email or Facebook. Today I’ll be discussing oats. Feel free to share your opinion in the comments. We typically buy whole grain rolled oats, occasionally I’ll buy steel cut oats. I no longer buy the instant oats. The rolled oats are less processed but can easily be whizzed through a food processor for an instant oat effect. It took a little while to get used to them but now they are my favorite. I felt like I was fueled longer when I ate the rolled opposed to the 1 minute instant. Still the instant are better than the little packages and most breakfast cereals. Oats are also inexpensive, I talk more about their cost efficiency here. If time is of concern the rolled oats can be made pretty quickly too. I make them in the microwave most mornings. You need a big bowl, not a typically cereal/soup bowl. I use a serving bowl. I don’t measure but just pour in enough for a few servings including water then microwave for 2 minutes. I stir then cook 1 more minute. It is usually perfect. It may take some practice but it is quick, easy, and inexpensive. If you think microwaves are evil, which I understand, they can be easily cooked on the stove. 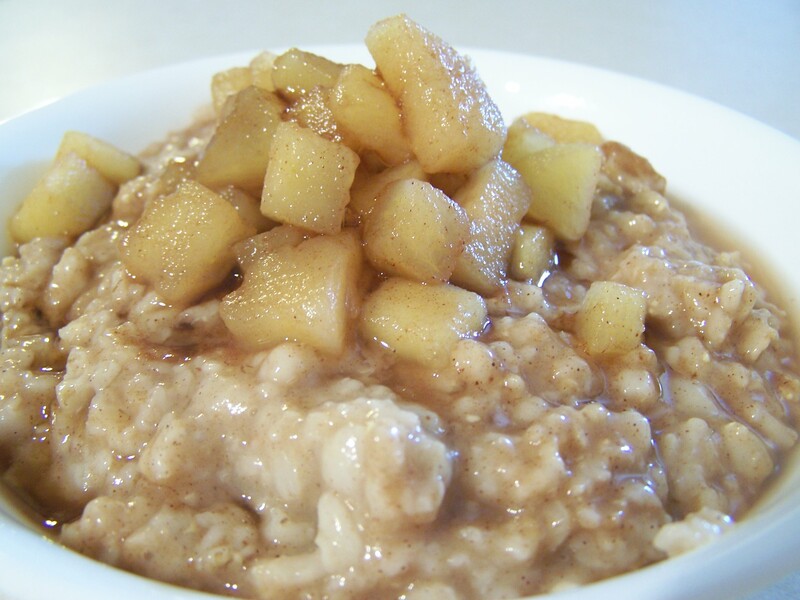 One cup of cooked oatmeal contains 307 calories, 5 grams of fat, 8 grams dietary fiber, and 11 grams of protein. When my family eats oatmeal we are less likely to make poor food choices a few hours later. My kids have evolved to favor oatmeal (even unsweetened) instead of cereal. They always ask for “sprinkles” which are really just chia seeds and walnuts. Oats are naturally gluten-free but are usually processed on the same equipment as grains that do contain gluten. Most oats are cross-contaminated with gluten. If you have a gluten sensitivity or allergy you can buy gluten-free oats that are processed and packaged in a dedicated gluten-free facility. Gluten-free oats will cost a lot more than oats that are from a regular facility. Do you eat oats or oatmeal? I can’t imagine an easier meal that is less expensive and healthier than oatmeal. At the next Healthy Cravings I’m going to have an Oatmeal Buffet with as many toppings and add-ins as I can imagine. What is your favorite way to eat oats? YUMMMM! Love oats. Added bonus that they’re so healthy! I soak my oats overnight and use them the next morning for baking muffins. I usually do 1 cup oats and 1 cup almond milk, mix together , cover and refrigerate over night. In the morning the oats have soaked up the milk and this starts my muffin base. Throw in some chia seeds and it makes it even better! Oatmeal is my go to breakfast! Even when I’m traveling I eat my oatmeal. A lot of coffee shops serve it these days. I always make sure to find a place that actually makes steal cut or old fashioned oats, however. I hate quick oats and a lot of coffee shops just add water to sweetened quick oats, which makes me gag! I purchased one of the Bosch universal mixers and grain grinder to make my own whole wheat bread. The Bosh universal also has a Oat flaker so you can get the freshest oats possible. Also the oats in 20lb bags really cuts the price per pound. Thanks for that great review. I always appreciate to hear what “real people” say about appliances (as opposed to a sales page for a company). I’ve heard great things about grinding your own oats.